Standard Lengths From 2½ to 15"
The OMEGA™ bimetal thermometer is specially designed for direct insertion into process applications when a standard thermowell is not specified or the process environment is not exposed to pressure. 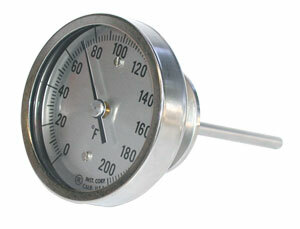 The bimetal thermometer is ideal for process industries. ** 4" minimum stem length. add "-NIST" to end of the model number for a 3 point NIST calibration certificate and add $100 to price.